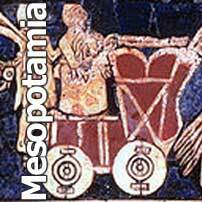 By the mid-sixth millennium the third of the Neolithic Mesopotamian farming cultures had appeared, this time in northern Mesopotamia. 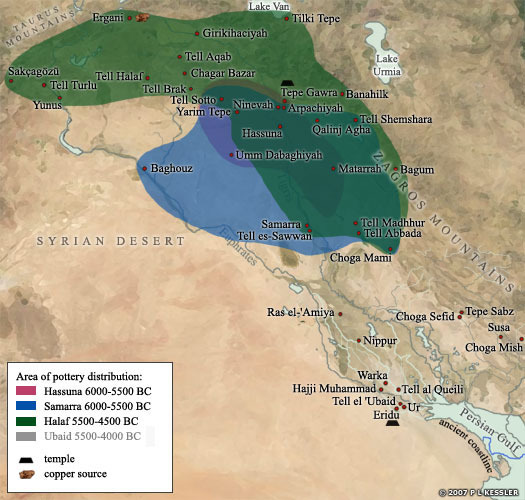 The Halaf culture (5500-4500 BC) was named after the site of Tell Halaf, in the Khabur Valley in north-eastern Syria, where it was first identified. It was centred on northern Mesopotamia between Lake Van and Samarra (south of modern Tikrit in Iraq), filling the gap between the Tigris and the Zagros Mountains, but initially it extended little further west than that. Halaf was unrelated to earlier north Mesopotamian cultures, and may represent the arrival of new settlers from outside the region. For its first few centuries, it was concentrated to the east of the Euphrates, before it began spreading west into northern Syria towards the footsteps of the Taurus Mountains. To date, no Halaf settlement has been extensively excavated but some individual buildings have been uncovered. Tell Aswad (in the Balikh Valley in Syria) and also perhaps Chagar Bazar saw the transition into the Halaf, while many other settlements in this region such as Tel Aqab and Tepe Gawra were probably first occupied during this period. Tell Brak is another of these, though it is possible it was first settled in an earlier period. Its architecture was distinctive, characterised by domed round-houses built of sun-dried clay, the largest exceeding ten metres in diameter. Among the best-known Halaf sites are Arpachiyah, Sabi Abyad (south-east of Yunus and outside the main Halaf coverage area), and Yarim Tepe, small agricultural villages with distinctive buildings which are perhaps inaccurately known as tholoi in reference to much later Greek structures. Instead it is possible that some of these structures were temples. These rounded domed structures, with or without antechambers through which the domed area was approached, were made of different materials depending on what was available locally: limestone boulders or mud and straw. The walls were sometimes placed on stone foundations and may have been for ritual use (one contained a large number of female figurines), but other circular buildings on this and other sites were probably just houses. The buildings found on the later sites west of the Euphrates were usually rectilinear, as at Ras Shamra (near the Mediterranean coast, not far from Sakchagozu in south-eastern Turkey). New burial customs are associated with the Halaf culture. Many people were now buried in shaft graves, formed from a deep, narrow shaft sunk into the ground. Burials were then placed at the bottom. There is also evidence of complex cremation rites which included the ritual smashing of grave goods, and the burial of ashes in a pot below the house floor. The Half produced pottery that is among the finest ever made in the region. The Halaf potters used different sources of clay from their neighbours, and they achieved outstanding elaboration and elegance of design with their superior quality ware. 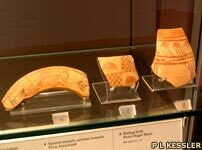 Each site made some of its own pottery but imported the rest from nearby centres and even from sites further afield. The finest polychrome Halaf vessels came from the potter's workshop at Arpachiyah. This site and Tepe Gawra have produced typical Eastern Halaf ware while a rather different Western Halaf version is known from such Syrian sites as Carchemish (a Syrian city on the Upper Euphrates which became important under the later Mitanni and Assyrian periods) and Halaf itself. The pottery had a fine painted monochrome or polychrome finish in black, brown or red, on a buff background which was burnished. Other vessels were coarser and undecorated with hand-smoothed surfaces. 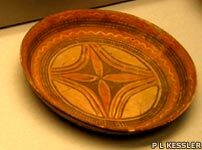 These classes of pottery were typical of the pre-Halaf period but they continued to be made by the Halaf culture. Such Halaf shards are indistinguishable from Neolithic examples. How and why their pottery spread so widely is a matter of continuing debate, although analysis of the clay indicates the existence of production centres and regional copying. It is possible that such high-quality pottery was exchanged as a prestige item between local elites. 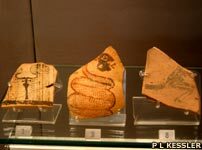 As well as their fine painted pottery, the Halaf communities made baked clay female figurines and stamp seals of stone. These latter artefacts are often thought to mark the development of the concept of personal property, because at a later date seals were used to produce marks of ownership. They also imported materials for jewellery. 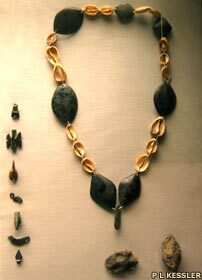 One find from Arpachiyah consisted of six obsidian beads and one of dark clay which seems to imitate obsidian, a material which had to be imported from eastern Anatolia. The cowrie shells will have come from the Gulf, and originally contained red ochre. The population of the Halaf practised dry farming (based on natural rainfall without the help of irrigation) growing emmer wheat, two rowed barley and flax. They also kept cattle, sheep and goats. There is little evidence of conflict between Halaf groups, and projectile points are correspondingly rare. Sling bullets are common but these may have been used in hunting rather than warfare. The discovery of twenty-four human skeletons buried in a disused well at Tepe Gawra may be a result of such apparently rare warfare, or they are just as likely to be plague victims. The Halaf existed alongside the fourth and most successful of the Neolithic cultures, the Ubaid, for approximately a millennium, before the latter eventually absorbed and replace it. The pottery of the third culture of this area, Halaf, is found in sites from central Mesopotamia to eastern Anatolia, often close to the sources of important raw materials such as copper and obsidian.